When Alice was born, she had a stroke that badly affected her right side. She was already likely to have issues from low muscle tone, which is common in people with Down syndrome. The stroke would just make things more challenging. At eight months, Alice surprised us. She said, "up". She loved the word "up". "Up, up, up, up!" It was wonderful. We had a belief that she had a gift in language. While there is also a consistency in kids with Down syndrome being speech delayed, speech is not language. Functional MRIs done by researchers has shown that while related, they are in different parts of the brain. Alice's Early Intervention case managed suggested getting a speech therapist on board and pulled some strings to get one the better ones who also has a child with Down syndrome. While we didn't always agree with her methods, she did a number of things that had terrific results. One of the best was that she lent us two videos of a TV show called Signing Time (http://www.signingtime.com/). Alice was immediately drawn in and loved watching every minute. It wasn't long after that I was getting ready to go to work and I tickled her for good measure before I left. She signed 'more'. In seeing Alice's strength, we worked it hard. We learned a form of sign language called Pidgin Signed English, which is ASL signs in English word order, but without the cruft of conjugation and articles used by Signed Exact English. We spoke but we signed too. We used Sign Language as a kinesthetic highlighter to our speech. The result was that we started to see into her mind. She told me that her uncle was in the back yard with a pig. Holy cow. We devoured every new Signing Time video, as did Alice. This provided some interesting issues - we could speak with Alice and understand Alice, but none of her relatives could. We had to interpret. It was even more challenging because of her stroke and low muscle tone - many signs looked "funny" or were indistinguishable. Without context, it was hard to tell the difference between "grass", "color", "mommy", "eat", "dirty", "pig","good", "thank you" and "water". All of these signs are made with the dominant hand near the mouth. Context is what makes it possible to really tell the difference. We always showed the correct sign, but didn't push hard - it's all about communication, not correction. Alice's signs eventually fell into place. And so it's no surprise that we became huge fans of Rachel Coleman, co-creator and star of Signing Time. How could we not? Her work helped jump start Alice's communication. When Alice started preschool, she had age-appropriate vocabulary, just not spoken. 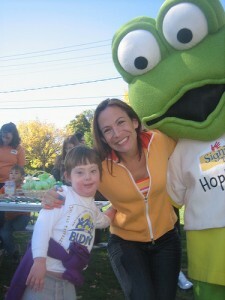 This past weekend, we went to the 2010 Massachusetts Buddy Walk. Mostly because Rachel Coleman was going to be performing before the walk. Alice didn't sleep well the night before and was super cranky the whole day. That all went away when Alice saw Rachel and Hopkins (Hopkins is a frog who helps teach the signs in the show). She beamed and wanted to go running up ahead of everyone else. It was terrific to see. I gave Rachel a great big hug and thanked her for everything that she has done. When Rachel did her stage show, she picked Alice along with other kids to help her sing her song Colors of the Rainbow. Alice eagerly went up on stage and did a great job signing. I didn't know whether to smile or cry. Maybe those are the best moments.